Steer Watch for men by Montana Silversmiths. 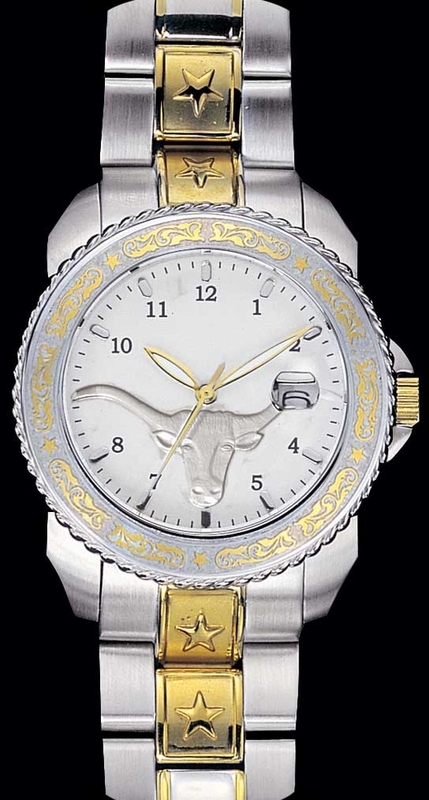 A silver, sculpted longhorn steer is featured on the face of the Steer Watch. Water resistant. Durable ionic gold plating and stainless steel watch casing. Glow-in-the-dark hands and hour markers. Magnified date function is built into a high grade, scratch resistant, mineral crystal lens. Highly accurate electronic quartz watch movement. Stainless steel watch bracelet adjusts to most wrist sizes with removeable links. Each Montana Silversmiths watch includes a product specific warranty. Ships in 1 - 14 days. Please let us know if you have a close deadline -- we will do our best to accomodate.